Knowing what home ownership implicates is crucial to getting started with the home buying process. A mortgage payment is not the only aspect to account for when it comes to becoming a homeowner, you need to keep in mind other expenses that may arise. Home ownership is a rewarding commitment that will require of your time and responsibility. 2) Get a credit history report. Knowing where you stand in the credit report scale cannot only give you a better sense of what you can afford, but also help you take actions in order to raise your credit score if needed. The higher your credit is, the lower your interest rate will be; therefore, lowering you mortgage payment. 3) Create a realistic and well analyzed budget. Finding balance between where you want to live & what you can afford is elementary to finding the right property for you. Create a realistic housing budget by analyzing how your housing expenses are going to change from your current living situation. What is your down payment goal? What loan term do you think would be ideal? What percentage of your income are you willing to direct towards unexpected housing expenses and repairs? These are some questions you want to ask yourself during the process of creating a budget. 4) Get pre-approved by a mortgage lender. 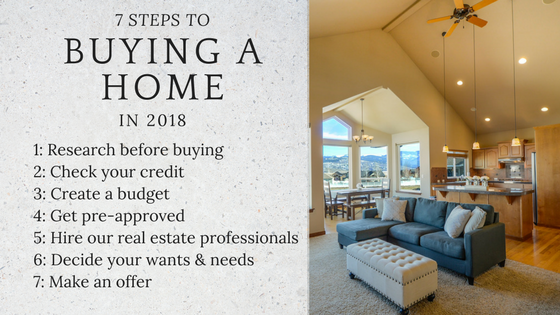 Now that we have covered the beginning stages of the home buying process, at this point you should be ready to contact a lender of your choice and find out what you qualify for and what opportunities you have access to in the mortgage loan market. Do not panic if you don’t qualify! Making your lender aware of your planned housing budget and goals will help your lender inform you if these goals are realistic or not. This will also allow them to make suggestions on how to work on your credit in order to be pre-approved in the near future. This is the most important acquisition you will make in your life, and giving it the importance that it deserves should be your main priority. Hiring a real estate professional will not only improve, but enhance your home buying experience. Our real estate agents can help you understand the buying process, negotiate better sales contract terms, provide you with a well-rounded list of service providers & more. All while keeping your best interest at the forefront taking all of your wants and needs into consideration. 6) Decide what you want most in a home. During the home shopping process, giving your Realtor® a list of “must have” & “nice to have” will assist with creating a solid idea of what you are looking for. Your expectations may shift as you begin to look at homes, but don’t let your priorities change drastically. It is okay to take your time finding the right house. After all, your new home will be a place where you will create new memories that’ll be cherished for a lifetime. When you find the house you’d be happy to call home, be ready to make an offer as the market is always moving at an ever-changing pace.